Its raining awards for ‘Feel the Punch’. The students of ‘Dilsukhnagar Arena’ have once again brought laurels to the academy by bagging the ‘Best Animation Film Award’ at the 2nd edition of the Hyderabad Short Film Festival (HSFF) 2011. “Feel the Punch” is a hilarious 3D animation short film in which a beggar outsmarts a bystander. The climax especially leaves the audience in splits and is an indirect satirical reflection on the evolution of technology. Apart from the fact that it has bagged eight awards at reputed film festivals around the globe( excluding HSFF), “Feel the Punch” has another distinction : it is the only animation short film on you tube with nearly nine and a half lakh hits to its credit. The 2nd edition of the Hyderabad Short Film Festival was a grand affair with a good turnout of fans and aspiring filmmakers. Prominent Tollywood personalities graced the occasion and spent some quality time with the budding filmmakers. In short, the festival which was held on the 17th and 18th of March at Prasad Labs in Jubilee Hills, Hyderabad was a memorable occasion. Mr. Relangi Narasimha Rao, famous film director of Tollywood, gave away the award for “Feel the Punch” to RajaSekhar Buggaveeti, the MD and CEO of ‘Dilsukhnagar Arena’. Yet another award only goes to emphasize the quality of the training at ‘Dilsukhnagar Arena’ and stands testimony to their expertise in the field of Animation. ‘Best Animation Film Award’ at the 2nd edition of the Hyderabad Short Film Festival 2011. 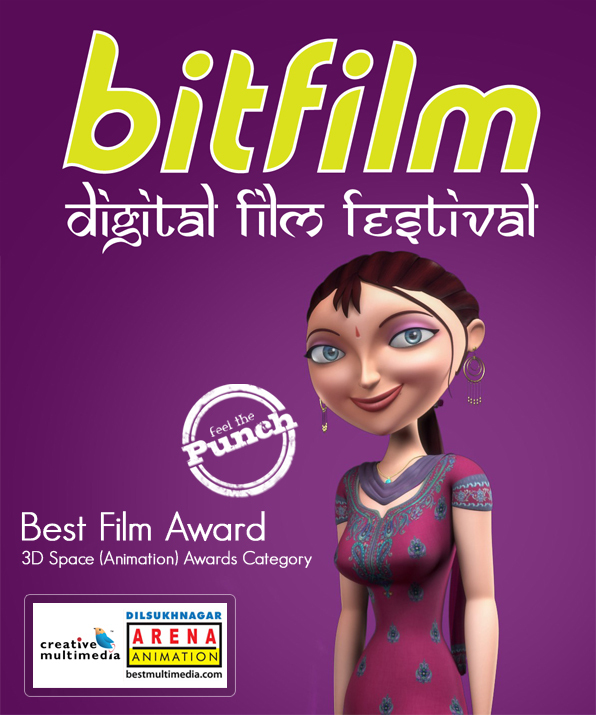 ‘Feel the Punch’, an Animation short film crafted by students of Dilsukhnagar Arena was declared winner of the ‘Best Film Award’ in the 3D Space (Animation) Awards Category of the Bit Film-12 Digital Film Festival on 25 November, 2011. An extremely funny short film, ‘Feel the Punch’ was conceived and animated by students of Dilsukhnagar Arena as part of their industry-oriented Animation training program. The Academy offers revolutionary Animation training and has been setting the standards in Digital Media Education ever since inception in 1998. Students of the Academy have been dominating the awards circuit and have brought home 37 prestigious awards so far at various national and international film festivals: the latest being ‘Feel the Punch’. By far the most popular film in its category in India, ‘Feel the Punch’ is a rage on Youtube with its video having registered over 8.5 clicks (8,54,947 as on Nov 26, 2011). No other film in this category has been able to even come close to this extreme adulation on Youtube. What’s more, Dilsukhnagar Arena has won seven coveted awards so far: another impressive and unrivalled achievement. The coveted award at Bit Film-12 Digital Film Festival marks a glorious milestone for the ‘Feel the Punch’ as well as Dilsukhnagar Arena as it happens to be the first international award for the film as well as the Academy-https://bestmultimedia.wordpress.com/2011/11/26/best-film-award-for-dilsukhnagar-arenas-feel-the-punch-at-bit-film-12-digital-film-festival-germany-rajasekhar-buggaveeti. 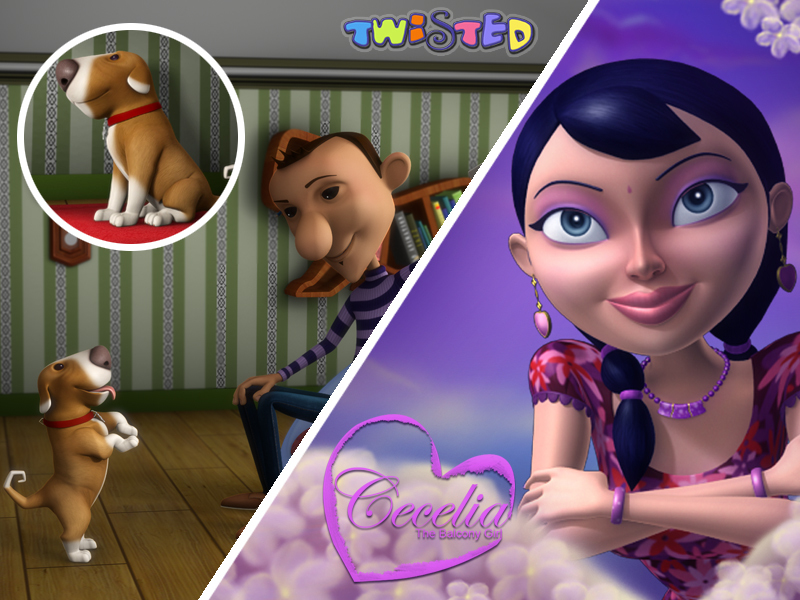 …..‘Twisted’ its way through competition to capture the ‘Best 3D Animation Short Film Award’. Dilsukhnagar Arena students walked away with the ‘Best 3D Animation Short Film Award’ in the ‘Student Category’ of the ASIFA India Awards of Excellence -2011 for their film ‘Twisted’ which was declared the winner at the awards night held on the evening of Sunday the 6th of November, 2011 at Mumbai. The award marks the film’s debut at the awards circuit. ‘Twisted’ features a hilarious episode between a master and his pet. The film enjoyed a grand launch by three time national award winner and VFX Supervisor of the iconic Rajnikanth film ‘Robo’, Mr. Srinivas Mohan during Dilsukhnagar Arena’s 13th Anniversary Celebrations. 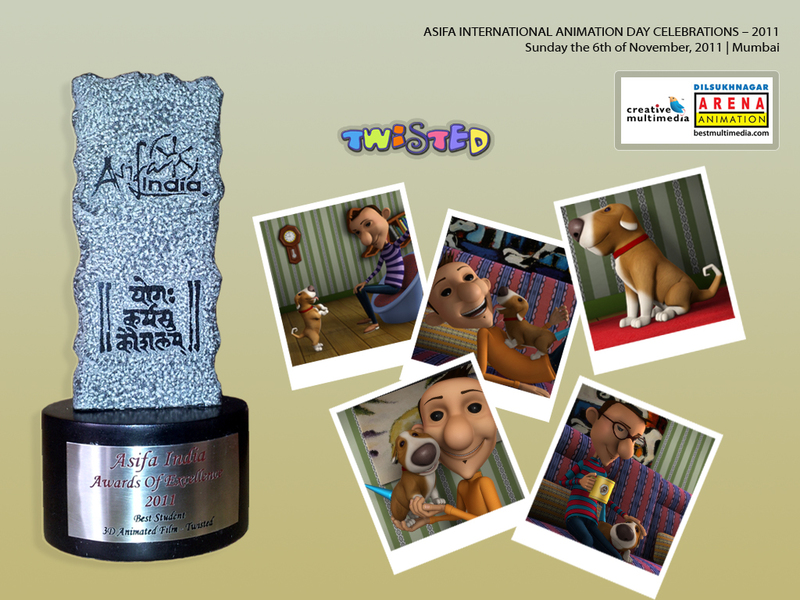 ‘Twisted’ its way through competition to capture the ‘Best 3D Animation Short Film Award’. ASIFA’s International Animation Day (IAD) is an annual global celebration aimed at recognizing the people involved in the art and technology of animation. This year, IAD is being celebrated at various locations throughout the country (Mumbai, Indore, Hyderabad, Pune, Bengaluru, Chennai, Kochi, Calicut, Thrissur and Trivandrum) between November 6th and November 13th. Some of the cities will have day long events and in some cities, screening of animation content will take place. Several entertaining and enriching programs/session have been lined up for the celebrations. The festival moves to Hyderabad on November 13, 2011. Dilsukhnagar Arena students once again demonstrated their class at the awards circuit by capturing two nominations in the Student Category of ASIFA’s IAD-2011 Awards of Excellence for their 3D Animation Short Films ‘Twisted’ and ‘Cecelia – The Balcony Girl’. The winners will be declared at a sparkling function to be held at Mumbai on November 6, 2011. Out of a total of 12 nominations in the Student Category, Dilsukhnagar Arena captured two nominations, the highest by any Academy at these Awards. Both films are comic thrillers with distinct themes. The films were crafted by Dilsukhnagar Arena studetns as part of the internship program at DNA Inc. (Dilsukhnagar Arena Incubation), the talent transformation initiative of the Academy which aims to groom studio-ready CG Artists. The festival is celebrated every year with great pomp. Since its start in 2002, IAD has been a film festival that has provided Indian animation artists, a platform to interact and build a community. Being amongst the first animation festivals in India, IAD has been actively supported by the artist’s community and the industry at large. It is a matter of great pride for all of us at Dilsukhnagar Arena that the enchanting 3D character ‘Mona’ in our immensely popular and successful Student Short Film ‘Feel the punch’ was featured prominently as a poster at the inaugural of the Bitfilm-12 festival in Germany. Amidst a starry array of entries from across the world, it is indeed a great honour and a tribute to our training standards that our film/character was chosen for the official poster at the launch venue. It may be recalled that ‘Feel the punch’ has already won a coveted nomination at this prestigious international film festival along with our other student short film ‘Hugo Vs Lino’. ‘Feel the punch’, a hilarious short film crafted by students of Dilsukhnagar Arena Animation was honoured with a prestigious nomination at the Annual Bit Film Digital Film Festival, Hamburg, Germany. After Monstra-2011 Lisbon Animated Film Festival in Portugal, this is the second international nomination for ‘Feel the punch’. The film has already created a record of sorts by capturing seven coveted awards till date apart from emerging a rage on You Tube with its video registering well over 8 lakh clicks (8,23,401) till date (13 Oct, 2011). Feel the punch is a 3D Animation Short Film which presents a funny encounter between a youngster, a girl and a beggar. The Bitfilm Festival is organised by Bitfilm Networks GmbH, based in Hamburg (Germany). It was founded in 2000 as a festival for digital film in Hamburg. 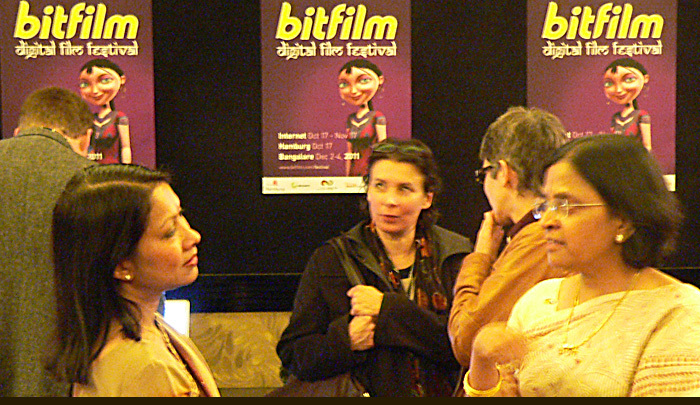 In 2011, the Bitfilm Festival will take place on the Internet, in Germany’s media capital Hamburg and in India’s hi-tech metropolis Bangalore. Bitfilm Festival has been showing films that use digital technology in a creative and innovative way. The Bitfilm Festival takes place on the Internet and in two cities each year: Hamburg and Barcelona in 2007, Hamburg and Stuttgart in 2008, Hamburg and Tel Aviv in 2009. It had guest appearances in Paris, Barcelona, New York, Tokyo, Frankfurt, Berlin and Cologne.